Great Dad’s day, Sophie invited the street over for a special morning tea, we then headed off to Hillarys for a BBQ with Mum and Dad, Bro and Sis and their respective families, this was followed by a massive Volleyball game…becoming something of a tradition me thinks! We came home, tired and ready for an afternoon sleep…but the call of my fathers day gift was too strong and at 12.30am this morning I finished it! 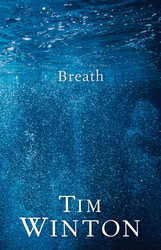 Tim Winton’s latest offering – Breath – A must read in my opinion. Thematically the same as many of his – the 3 ‘W’s” Wo, Water and Western Australia. It was a finely tuned master piece. If you love the water and in particular surfing, you will love this great book. The video on his site has some wonderful west aussie imagery in it. Tim Winton reads from ‘Breath’ from Virginia on Vimeo.